[Satnews] Keysight Technologies, Inc. (NYSE: KEYS) introduces a 50 GHz frequency extension to the M9393A PXIe performance vector signal analyzer (VSA), providing frequency coverage previously unseen in modular instrumentation. 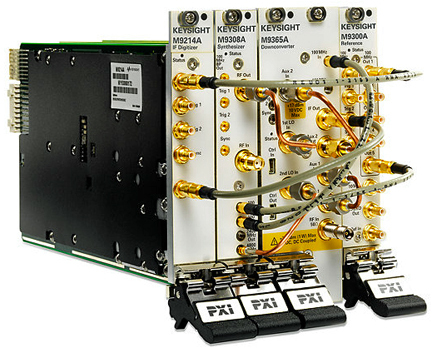 With coverage of Ka-band frequencies and beyond, the M9393A delivers Keysight’s proven millimeter wave (mmWave) measurement technology in a PXI form factor for manufacturing and design validation of modems, transponders and sub-components for commercial and military satellite communications. The innovative design of the M9393A offers engineers the ability to validate the performance of Ka-band designs with continuous frequency sweeps from 3.6 to 50 GHz (option FRX) and direct access to 800 MHz of IF bandwidth (option WB1). With displayed average noise level (DANL) better than -155 dBm/Hz at 40 GHz and accelerated sweep speed, the M9393A provides the fastest low-level spur searching capability on the market. The compact, modular form factor allows for dual channel configuration in a single chassis for increased measurement density and time synchronous multi-channel radio frequency measurements. The M9393A’s extremely low noise floor in Ka-band, combined with Keysight’s 89600 VSA software enables measurements of 20 GHz of spectrum with -110 dBm DANL, in less than 10 seconds, for the fastest measurements of low-level harmonics and spurs. This fundamental test is not only a regulatory requirement, it is a key indicator of system performance, and often a bottleneck in testing. In the past, this measurement has required the test engineer to trade-off coverage and time, with tests taking minutes to hours. The M9393A’s frequency sweep speed eliminates this trade-off and allows developers to track minute signal distortions that were previously not practical to examine. Upgradeable capability, including frequency, analysis bandwidth, number of channels and memory, allows engineers to quickly adapt to changing test needs, reducing overall cost of test. The extensible modular architecture of the M9393A allows for easy addition of the M9169E PXI-h switchable input programmable attenuator module, recommended for low noise, high reliability power control up to 50 GHz. The M9169E also enables automatic routing of the M9393A’s built-in calibrator signal, improving amplitude accuracy and uptime.